Men's Wedding Suits at MensUSA No one is going to deny how important weddings are. That's the reason choosing wedding apparel is so hard and stressful for so many people everywhere. Weddings are once in a lifetime occasions that mean so much to people. Selecting the right attire for men is very important If you're shopping for wedding suits for men, we understand how serious the process is. That's why we have such an outstanding selection of wedding suits here. 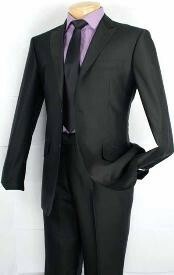 We have gorgeous collection of summer wedding suits and tuxedos. 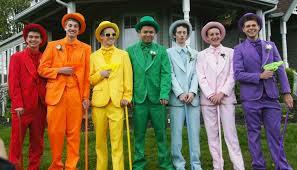 People who want to buy the best wedding suits for men on the Internet can turn to MensUSA 24 hours a day. 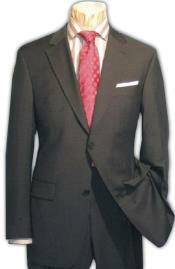 We're a renowned online shop that prioritizes five-star wedding suits for men. 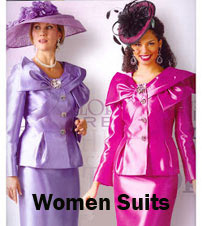 Our wedding attire can make amazing choices for all varieties of events. Customers shop at MensUSA when they need attire for formal events, work conferences, job interviews and birthday celebrations. 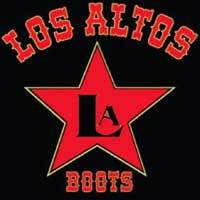 They visit us when they need superior wedding suits for men as well. 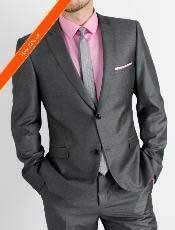 Our available wedding suits for men aren't just sophisticated, durable and attractive, either. They're also highly economical. If you're shopping for wedding suits for men that won't destroy your budget and make you feel miserable, our affordable pieces will give you an extraordinary sense of relief. Looking great at a wedding doesn't have to be something that costs anyone a hefty sum of money. Our wedding suits for men are perfect for happy grooms. If you're an eager groom who wants to look your best on the greatest day of your life, MensUSA is the way to go. 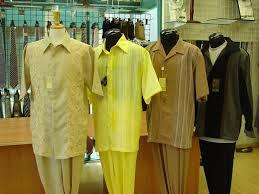 We provide shoppers with many fantastic options in suit styles. You can depend on us for the finest single and double-breasted suits out there. You can lean on us for the greatest single-button suits and five-button suits. You can turn to us for assistance with suits with all numbers of buttons. Our suit expertise is unrivaled. We know wedding suits here through and through. 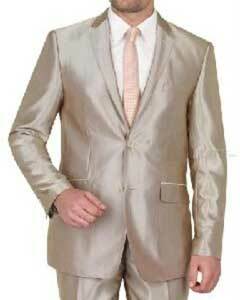 MensUSA offers wedding suits for men in all colors. These plentiful colors include charcoal gray, tan, ivory, cream, ash, chocolate brown, taupe, beige, navy blue, white, khaki, sand, black, camel, gold, bronze, blue and dark gray. You name your preferred wedding suit color and we can accommodate your wishes to a T. Our choices go beyond just colors, too. 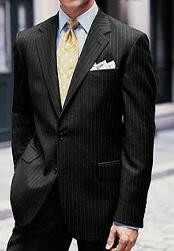 If you're someone who likes pinstripe wedding suits for men, our selection is sure to please you. 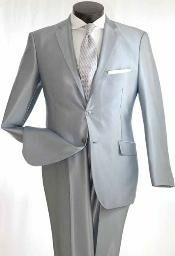 You should check out our latest nave blue wedding tuxedo it looks stunning. 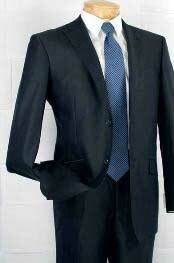 The features that are seen on our wedding suits for men are nothing to dismiss. If you're someone who has a passion for side vents, notched lapels, non-pleated pants, besom chest pockets and besom front pockets, we have everything you need right here at MensUSA. Our pants even come with unfinished bottoms that are great for any customization needs. We can help you regardless of your desired features. Our suits come with everything from numerous interior pockets to convertible flap pockets. 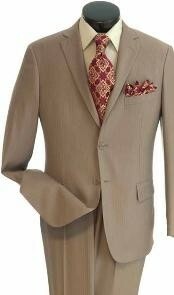 We stock wedding suits for men of all types of materials, too. If you like cashmere and wool combinations, our selection will go beyond all of your expectations. 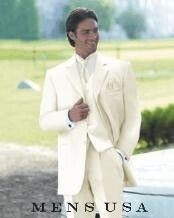 Contact MensUSA today to learn more about our fabulous wedding suit choices.